I've been noticing that an awful lot of filmgoers and critics have been comparing the new high school/coming of age comedy LOVE, SIMON to the films of John Hughes. I find such analogies to be somewhat odd and illogical. The film - based on Becky Albertalli's SIMON VS THE HOMO SAPIENS AGENDA - is just as shrewdly written, well acted, and crowd pleasingly funny as the best of the Hughes' body of work, but, last I checked, the late director's most iconic adolescent themed films never had homosexual protagonists, nor did they treat all of their characters - gay or straight, young and old - with equal levels of respect and compassion. And that's what specifically and refreshingly separates LOVE, SIMON proudly apart from the genre pack: It's the very first major studio film to focus on gay teenage romance and LGTB themes of inclusion. Yes, there have been a bounty of gay themed films that have dominated the cinematic spotlight as of late - Oscar winners and contenders like MOONLIGHT and CALL ME BY YOUR NAME come to mind - but LOVE, SIMON is a pioneering original in the sense that it's the first of its kind to deal with a closeted main character that's told exclusive from his young adult point of view. So many gay characters that have populated so many high school comedies - and comedies in general - have either been pathetically crude caricatures or have been reduced to eye rolling stereotypes that are the subject of scorn and ridicule. Part of what makes LOVE, SIMON so wholly unique is the spirit of acceptance of homosexuals by a majority of the people that surround the main character. There are large emotional burdens for this lead hero to endure alone the way, to be sure, not to mention that the makers here are perhaps guilty of milking some of the more well worn genre troupes, but LOVE, SIMON feels so authentically and sincerely rendered that you're willing to turn a blind eye to such nitpicky creative issues. That, and this film uses the age old conventions of the high school comedy in novel ways to make it come off as spontaneously fresh. 17-year-old Simon Spier (Nick Robinson) is a teenager that seemingly has it all in life. He's good looking, relatively popular within his close knit group of friends, is intelligent and ambitious, and lives with his fairly well off family in a luxurious home. As his voiceover track that narrates the film indicates, he seems like just about any other ordinary high schooler, except that he has one very large secret which is revealed very early in the film: he's a closeted gay young man. His loving parents - Emily (Jennifer Garner) and Jack (Josh Duhamel), both very good here - are educated and liberal minded enough to most likely accept such revelations from Simon, but he can't seem to muster up the courage to unveil his sexual orientation to them. 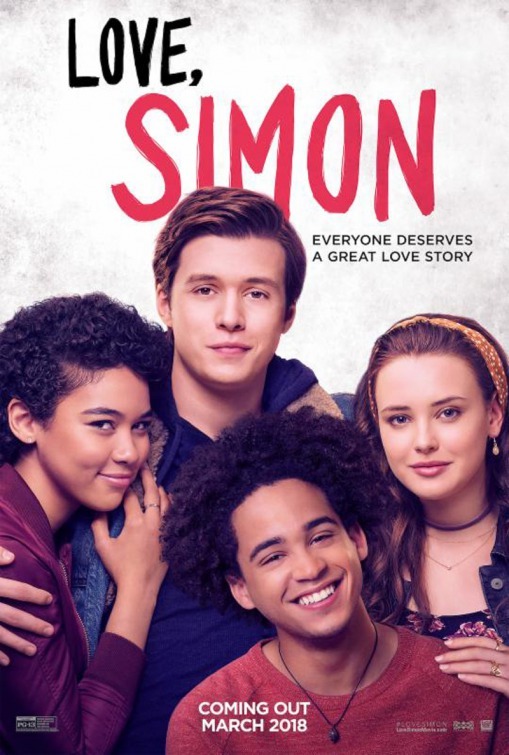 His school friends - Leah (Katherine Langford), Nick (Jorge Lendeborg Jr.) and Abby (Alexandra Shipp) - all seem hip and cool enough to accept Simon as gay, but he also can't seem to find a manner of breaking such news to them either. There's only one person that's aware of Simon's secret: An anonymous student that he exchanges emails with online dubbed "Blue" (also gay), who cathartically becomes Simon's only emotional outlet to relay the whirlwind of emotions that he's going through. Complicating matters for him is that he's slowing falling in love with Blue, but both feel the need to keep their homosexuality a secret. Simon tries as he can to keep his online relationship with Blue as carefully guarded as possible, but things get ugly when a fellow classmate, Martin (Logan Miller), catches wind of Simon's email correspondence with Blue (poor Simon forgets to log out of his account while on a public library computer, which leaves the ultra slimy Martin going on the vile offensive. The creep decides to blackmail Simon with an ultimatum: help him hook up with one of his female friends and he won't out him. Realizing that he has no other choice, Simon begrudgingly acquiesces to this thug's demands, leaving his strong ties with his three BFFs being threatened forever in the process. The central romance mystery at the heart of LOVE, SIMON is what allows for it to have such a playful and intriguing forward narrative momentum throughout. The identity of Blue is slowly, but ultimately falsely revealed with hint drops here and there, which prompts Simon to act on them, only to be dealt with crushing disappointment when he hits a dead end. And the fact that there are a number of potential and likely candidates makes the whole ordeal all the more nerve wracking for Simon. Robinson's performance here is as big of a delicate highwire act as the plotting itself, not to mention that it's a revelation (I found him to be thoroughly dilikeable as a sullen teen in JURASSIC WORLD). Robinson makes Simon such a genuinely pleasing character by not playing him in broad and obvious strokes. He's immensely appealing as the character, to be sure, but he also does a bravura job of underplaying his crippling anxieties and fears of coming out. I also appreciated that the script (from Isaac Aptaker and Elizabeth Berger) doesn't go out of its way to paint Simon as a faultless saint either. He commits multiple social sins in trying to keep his secret by using his friends in highly unethical manners. If anything, Robinson's thanklessly layered performance and the sharp writing here makes LOVE, SIMON subvert cookie cutter teen comedy conventions. Best of all, LOVE, SIMON deals with its titular character's mentally trying ordeal with ample heart rending empathy and it tries to get into his headspace to understand what he's going through and why it's so unrelentingly stressful. Simon's journey is steeped with nagging uncertainty for the future, and his pathos feels palpable and reel. There are, though, moments of riotous comedy and playful flights of fancy that are sprinkled in here and there for just the right effect, such as a spirited daydream sequence featuring the proudly out Simon dancing with fellow accepting college classmates to a Whitney Houston tune. One of the funniest scenes in the film occurs when Simon asks himself - and the audience - why "straight is the default" and why is it always gay people that have to reveal themselves to the world. What follows is another imaginary sequence showing multiple kids from different backgrounds revealing to their shocked parents that they're - gasp! - heterosexual. Some of the parents sob uncontrollably at the news. Fantasy montages like this in an otherwise dramatically grounded film don't capsize it, nor do they make the proceedings feel shallow. If anything, they embrace the depth of the underlining story's coming of age themes and all of the troubling conundrums that surround them. There's an underlining message of empowerment and, most importantly, compassion that's at the core of LOVE, SIMON, and it shows a character that's both struggling with his sexual identity, but is also not ruthlessly persecuted or punished for it. This genre is so overtly well traveled in terms of portraying tender and life affirming romances between young and conflicted characters, but LOVE, SIMON is a huge inclusive step forward in terms of making its LGBT tale as normal and relatable as any other about a straight kid. As a heterosexual man, I don't have any frame of reference to draw upon as to the hellish ordeal that Simon goes through in this film, but I nevertheless strongly related to his trepidation about who he is, where he fits into the world, and what the world has in store for him in the future. Those are universal concerns for all youth. That's perhaps the biggest takeaway from this film. LOVE, SIMON is not without flaws. There is something to be said about how Simon informs us that he's just like us as an average teen, but he seemingly lives such an affluent lifestyle with what appears to be extremely wealthy parents that definitions of "average" become a tad hard to swallow. That, and I really wished the film had something more to say about the profoundly manipulative Martin, who's blackmailing ways and twisted moral compass don't allow for him to evolve much more beyond a one note, mean spirited antagonist for Simon (he gets off way too easily near the film's end). Lastly, because the film wants the widest audience possible, if feels somewhat neutered by the restraints of a PG-13 rating, which tonally holds it back a bit. Yet, LOVE, SIMON is so ultimately sweet, charming, and warm hearted in its own way that it becomes a film that's really hard to overtly criticize. Plus, it's a bona fide watershed film in the genre. No question. When Simon finally discovers the identity of Blue and the pair embrace and kiss in the film's climax the audience I was with cheered and applauded. In the era of John Hughes high school comedies a similar scene would have been greeted with wincing groans. LOVE, SIMON proves that we've all come an awfully long way.